I have more than just steps on how to make meringue, check out more homemade recipes at the end of the page. 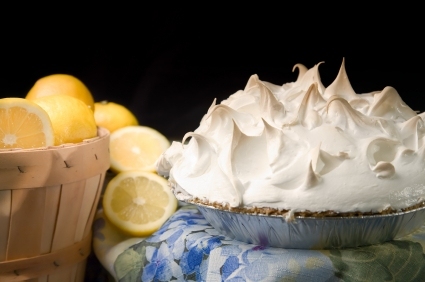 Learn how to make a perfect pie with meringue every time - Easy steps to a perfect lemon meringue pie or just meringue shells. When making meringue, be sure the bowls are completely clean, not one speck of grease or even soap residue; including the beaters. Separate eggs when they are cold and let the whites come to room temperature before beating. Be sure no egg yolk drips into the egg white. If you do, you might as well start over. If you beat the egg whites too long before you add the powdered sugar, the meringue won't have a nice firm texture. After you add the powdered sugar, beat the meringue until it's smooth and thick. To test this, take a spatula and run it through the meringue, it will part and stay that way. When putting on a pie, spread it around to get the bubbles out. Don't dump it on all at once; add 1/4 of the meringue at a time. To prevent weeping, make sure you bake them properly. Bake a soft meringue in a preheated 350 oven for 12-15 minutes, depending on the thickness of the meringue, or until golden brown. Cool at room temperature. After it reaches room temp, you can refrigerate. Use very thin pot holders when removing a meringue pie from the oven. Thick pot holders will bunch up and tear the meringue. Separate the yolks from the whites, being careful not to drip any yellow in the whites, or they won't beat up right. Put the whites into a bowl and add the cream of tartar. Beat until stiff on high speed. Add the powdered sugar and beat until soft peaks form. Spread 1/4 of the mixture onto the pie and begin to spread breaking up any air bubbles. 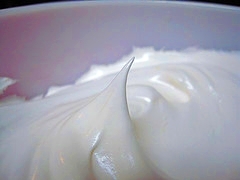 Spread meringue out to the edges and make a good seal over the filling. If you don't spread it out to the edge of the pie crust, your meringue will shrink and pull away from the outside of the pie. Use swirly motions on the top to make it look pretty. You can also use the bottom of a spoon to make peaks. Bake for 15 to 20 minutes, or until light golden brown. After ten minutes, I watch it carefully because I don't want it too brown. **Large and extra large eggs make poor meringue. Small eggs do not necessarily have less egg white and are preferred to large eggs if you can't get medium. Do NOT double the recipe. Just make another batch.